Merlot Made in a Goatskin? 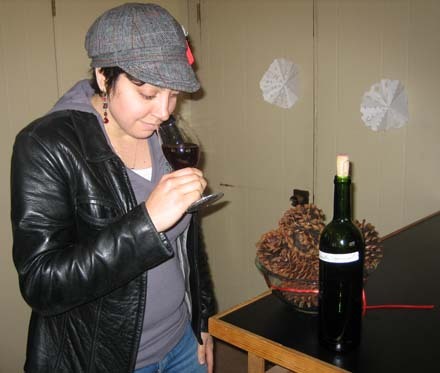 Wines & Vines administrative coordinator Stephanie Papadakis evaluates a 2007 Merlot fermented in goatskin. Lumberton, N.C. -- In November 2007, we received an e-mail from Jeffery Mcpherson, a horticuture and enology instructor at Robeson Community College in Lumberton. A fruit and vegetable farmer who had “dabbled” in grapegrowing, Mcpherson had seen a Headline on winesandvines.com featuring winemakers in the Republic of Georgia who fermented wine underground in giant earthenware amphorae. He hoped we could help him with another ancient technique: “I am searching for information about how wine was made by using the skins of an animal like a goat as the fermentation vessel,” he wrote. He started with freshly picked and crushed Merlot grapes, allowing them to ferment in the crushing vat for a few hours or even days. A goat was slaughtered “according to approved customs,” and the skin prepared. The juice was separated from the pomace and poured into the wineskin, which was tied shut and hung in a cool place. Prior to bottling, Mcpherson dosed the wine with 100ppm potassium metabisulphite to prevent spoilage. “I did this for the sake of preserving the wine so the evaluators would receive the wine unspoiled and as near to the ‘ancient’ finished product as possible,” he wrote. As 2009 flew by, somehow we never got around to sampling what we came to refer to as “the goat wine” at our semi-regular Friday tastings. An adventurous new staffer, however, encouraged us to open the bottle: Our holiday party would be the perfect occasion. Several of our columnists came to celebrate with us, and they too were curious, if not exactly eager, to taste this unusual wine. For comparison, we pulled a 2007 Central Coast Merlot from our winerack, and gingerly opened the Wineskin Experiment. Although Mcpherson had enclosed an evaluation chart, we chose simply to note our tasters’ reactions. What was the verdict on the “bag in baaaax” Merlot? The color, we found, was a lovely light garnet with a tint of rust, much paler than the plum-dark commercial exemplar. In body, it was rather thin vs. the commercial comparison. One taster found the aroma a little on the raisin-y side. Stephanie Papadakis, a vegetarian, found it redolent of childhood Greek Easters at Blackberry Farm in San Jose: Fleshy, and reminiscent of smoked goat. Other comments ranged from Cliff Ohmart’s “Not unpleasant;” Glenn McGourty’s “Not undrinkable” and Tim Patterson’s “I’ve made worse,” to web developer Dave Edmister’s “Nice, soft on the palate, almost velvety.” Papadakis and this (carnivorous) writer concurred that the finish was unique: Slightly metallic, like the coppery flavor of blood. However, we also agreed that, even though Merlot probably would not have been the variety used 2,000 years ago, wine drinkers of the day would likely have enjoyed drinking the results of the Wineskin Experiment. Should other winemakers have experiments to share, feel free to e-mail edit@winesandvines.